Treadmill Therapy For Kids Works! Here's The Results After 15 Months. You are here: Home / Therapy / Check Out The Results Of 15 Months Of Treadmill Therapy! You Have To Crawl (Or Drag Your Feet) Before You Can Walk. I remember when Noah first started on the treadmill I wondered if treadmill therapy for kids really worked. I mean as you can see in the videos below, in the beginning they would just strap him in to a special holster, lift him up to where his feet just barely touched the treadmill, turn the treadmill to a very low speed, and he would just drag his feet across it. It didn’t seem like it was doing anything. But it was helping him learn to walk! Check out our little walker! It’s amazing how far Noah has come since we first started, and how well he can walk after just 15 months of treadmill therapy. We’re obviously huge fans of treadmill therapy and our son is a living testimony that treadmill therapy for kids really does work! Because we’ve seen the results first hand, we’ve written extensively on this topic. 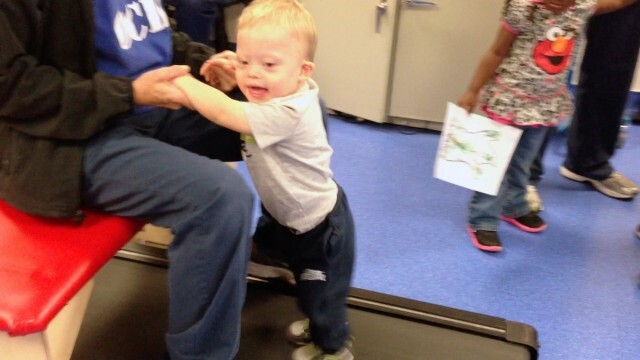 Some posts that have been very helpful to people are: The benefits of Treadmill therapy, How treadmill therapy can help kids learn to walk, and the Free Download of the Procedures To Use The Treadmill Training In Infants With Down Syndrome. If you’re interested in learning more about how this sort of therapy can help kids learn to walk I encourage you to check those posts out. These feet are made for walking! 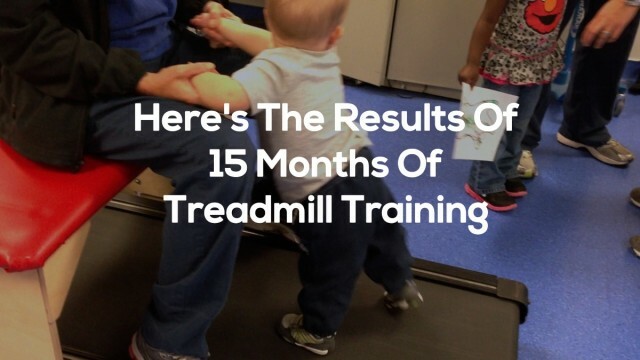 I thought it would be fun to list all of Noah’s treadmill videos so you can get an idea of the type of progress he has made, and how it has helped him learn to walk. Isn’t it amazing how much of a difference a little bit of time (about 15 months) plus a lot of hard work, love and encouragement can make in a child’s life? Press play on these videos and see the progression for yourself. Yelp. Treadmill training really works! I’m so proud of this kid. I know I say that all the time, but I can’t say it enough. I’ve never met a more hard working toddler. All this kid has ever known is hard work. He started developmental therapies when he was just three weeks old and has been working hard every since. We celebrate every milestone, big or small, around our house, and encourage Noah like none other. In case I wasn’t clear – I love this kid!!! What do you think of treadmill training for children? Has your child ever been on a treadmill? 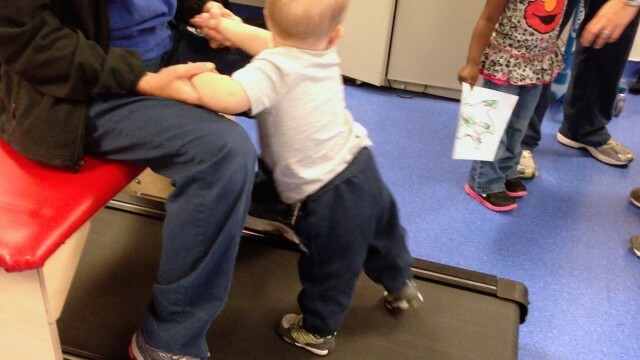 What therapies have helped your child learn to walk? Your little dude is awesome. I really appreciate the updates. He is lucky to have a great dad like you. I have 8 grandchildren that I dearly love. One of them, Bella, has Down’s syndrome and she is the light of my life. I call her my little princess. She is 6 years old and she is constantly making great progress. She does have a special ed teacher, but most of her progress can be attributed to her mother, my daughter, Jennifer. She is constantly reading up on new teaching techniques (she is a teacher, herself) and going to seminars. Noah, like Bella, is truly a gift from God. how old was noah when you first stared using the treadmill? also was he already crawling ? Thanks for your comment. We put a data at the start of each video and you can also check out http://sweltering-berry.flywheelsites.com/milestones – Let us know if you have any other questions. 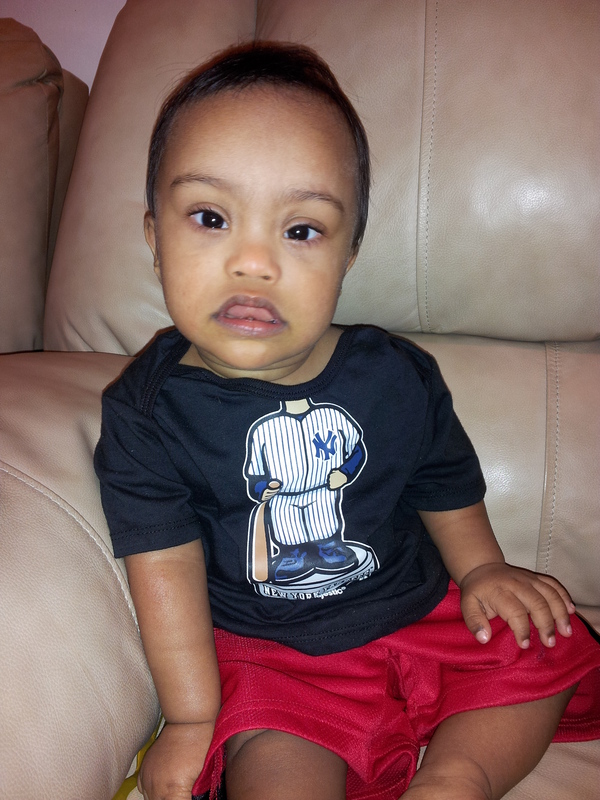 My son, David, who is 2.5 y/o and born with Down Syndrome has been getting just regular PT since he was 6 months old. He is still learning how to walk. Unfortunately, in NY where we live, they don’t offer treadmill therapy and was wondering if a parent could do this on their own at home? Hi! Thanks for your comment. I’m certain you do treadmill therapy at home, in fact we actually posted the entire treadmill protocol on our website so you can download it for free. Also, I bet there are therapists that use the treadmill where you live as it is pretty common now. Have you asked our current physical therapist about it, or shown them our blog posts? What were there thoughts? Wow… this pic posted much bigger than I expected! Sorry! Thanks for the comment. Not sure what you mean. Wish they had that kind of therapy 24 years ago. He didn’t walk until he was 5 years old. He is relatively far behind where he would have been, as I was told at the time, because he didn’t learn to walk earlier. I made sure that he could talk and get his needs known. He is pretty good at telling us the basics of what he needs. I know that I shouldn’t compare what is available now vs. what was available in 1990. Thanks for listening. He is also far from being toilet trained. He either doesn’t understand adequately what he needs to do or he just doesn’t feel it until it is too late. He is somewhat schedule trained. I thought if he could tell you he was wet that then he could do the rest. I just don’t know. Hey Becky, Thanks for your comment and for sharing. I often think about how much “better” things will be 24 years from now even. Not just for people born with Down syndrome, but everything..cancers, sicknesses, etc…But at the end of the day I trust the Sovereignty of God and I know He is control. He chose Noah (and your son) to be born exactly at the time they were born…and I’m confident in that, so I have peace. Since Noah is only three years old I only know about what resources have been available during that time. What sort of resources did your son have as a child? Was early intervention around? Or OT / ST / PT? I had no idea that they had treadmills for children as small as Noah. 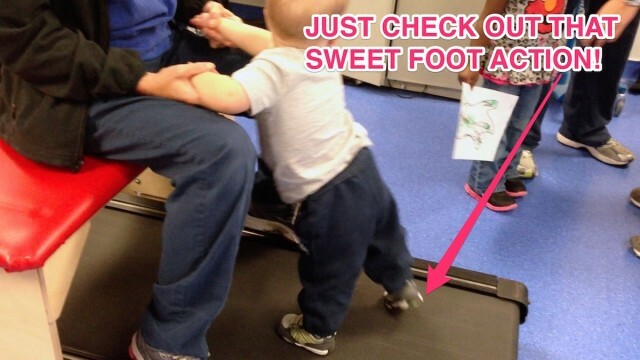 What a great idea to try treadmill therapy to help kids learn to walk. Noah has improved with each session. Such a simple idea, I say that because treadmills also can teach adults to run and they do all the time. Amazing seeing your sweet happy boy and his journey to learn to walk. He did and is still doing great from what I can see in the videos and from what I can read in your blogs. I love Noah, he always makes me smile. Happy parents make happy kids you are doing a great job teaching him all kinds of things and he makes everything look easy. I am proud of Noah right with you. When I first saw this I admit my response was very ignorant! I thought treadmill, big deal!! But then looking at the other videos and seeing that foot placement and their use wasn’t a natural thing for Noah. He had to be shown how to place him feet and what to do with them, and then watching the progress, it is so amazing!! You must have such a very patient family and Noah but be such an amazing child! We sit there and wait for our kids to just stand and walk on their own and it just happens, but Noah has had to be taught and practice every little thing to walk. Its just incredible to see on the videos. Thank you for allowing the ignorant ones such as myself a sneak peak into your life with Noah. I am so much more aware now of what may be happening in the lives of others. I have a brother who was bashed up a few years ago and left a paraplegic. He is slowly slowly learning to walk again and teaching his muscles what to do again.. such a long agonizing process, this helps me to appreciate what he goes through everyday too, the determination he must have to keep fighting to have the freedom of walking! I think you for that understanding! Noah is precious. Did y’all use Our Children’s House at Baylor? If so, how was your experience there? They want my son to do inpatient for aspiration and feeding issues. I cannot wait to do this with my grand child and yes…He is 8 months and has been in early intervention early after birth! Thank you for sharing! Can you please tell me which model of treadmill do you have at home or therapy room? My daughter had treadmill therapy before. But now I’d like to have treadmill at home.